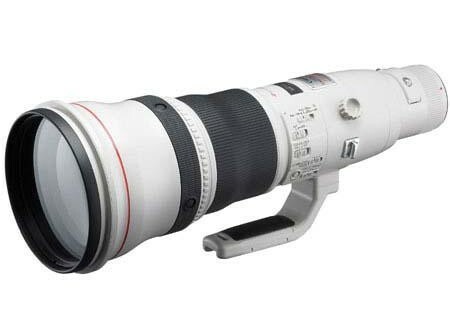 By far the largest and the most expensive commercially produced lens from Canon (the 1200mm f/5.6 super telephoto lens is manufactured only on demand and is an extremely rare piece of optical marvel) the EF 800mm f/5.6 L IS USM lens is not for someone with a faint heart. 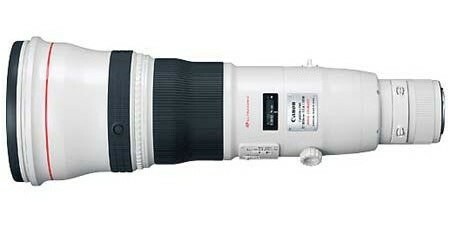 It costs a hefty $14,000 and is one most definitely built for only the most interested wild-life or sports photographer. So monstrous is this lens that it comes in a trunk of its own for transporting. However even for its monstrous focal length the lens actually weighs just under ten lbs (9.9) only making it (quite surprisingly) lighter than the 600mm f/4 IS. This monster telephoto lens has a total of 18 elements including two fluorite elements, one UD (Ultra-low dispersion) and one super-UD glass element arranged in 14 groups. The lens has a great performance when it comes to color fringing, flares and ghosting. Not surprisingly when mounted on a full frame sensor the diagonal angle of view of the lens is only 3° 5′. Canon has provided ring-type USM (Ultra-Sonic Motor) on this lens making it quiet during auto-focusing. The diaphragm of the lens is built using 8 rounded blades. The soft bokeh that the f/5.6 aperture provides isolates the subject from the background quiet beautifully. The closest focusing distance of the lens is 19.7’ (6 meters) with a magnification ratio of 0.14x. The external dimensions of the lens are 6.4” x 18.1”. The lens takes a gelatin filter of 52mm.